I originally posted this back on July 10, 2008 — before I knew how to insert photos. Fathers and sons and baseball. You can almost hear the violins, the sap rising from the roots. It’s a tired cliche, of course, but that doesn’t render the dynamic meaningless. 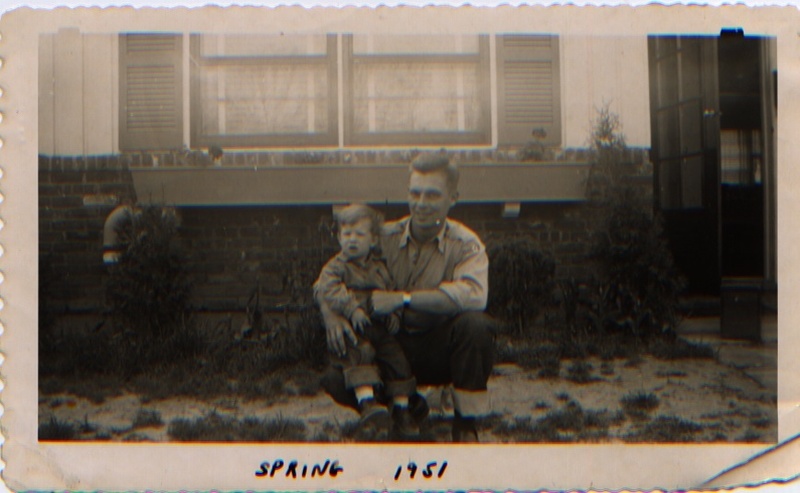 My father, ten years before I came along, with Neal or Billy. My father wasn’t a sports guy; I can’t remember him ever turning on the television to watch a game of any sort. Hey, I can’t remember having catch with him. But I had four older brothers, and my baseball-loving mom, and a dozen kids on the block for that. Dad was Old School. I think of him as more CEO/CFO in Charge of Household as opposed to today’s helicopter-style parent, forever hovering, eager to bond and share and become best buddies. That wasn’t my father’s way. So, basically, I played Little League and my father did other things. And I want to make this clear: It was perfectly okay. But one year, when I was ten years old and playing for the Cardinals — astonishingly vivid memories of those games — somehow my father got roped in as a coach. He didn’t know a blessed thing about baseball. Didn’t care to know. The manager, hard-nosed Larry Bassett, taught my father how to keep the scorebook and I’m fairly certain that was the full extent of his usefulness. I found it embarrassing. Not horribly so, but it felt odd to see my father on the ballfield, clueless and unathletic. What did the other boys think? It was 1971 and my dad was painfully uncool. I loved baseball deeply, passionately. In that sense, we lived on separate planets. Of course now, years later, I see it from a different perspective. And it boils down to this: He was there. As a parent, isn’t that 98% of the job? Just showing up, day after day. Being there. My father is gone now, died almost two years ago, fell on the front lawn and never got back up. Maybe that makes you (me) appreciate those times, those presences, all the more. For he will never “be there” again. He never read Six Innings, either. If he did, I would have told my father that I loosely modeled a character after him, Mr. Lionni, Alex’s dad, right down to the thick-framed glasses and questionable attire, the black socks, brown loafers and shorts. There’s a scene when Mr. Lionni takes his baseball-loving son, Alex, for extra batting practice. That scene sprang directly from my childhood; I remember the one and only time my father pitched batting practice to me — awkwardly, poorly, like he was hurling foreign objects. But I was struggling with the bat, the same as Alex in my book, and that man, the father, tried to help the best he could. 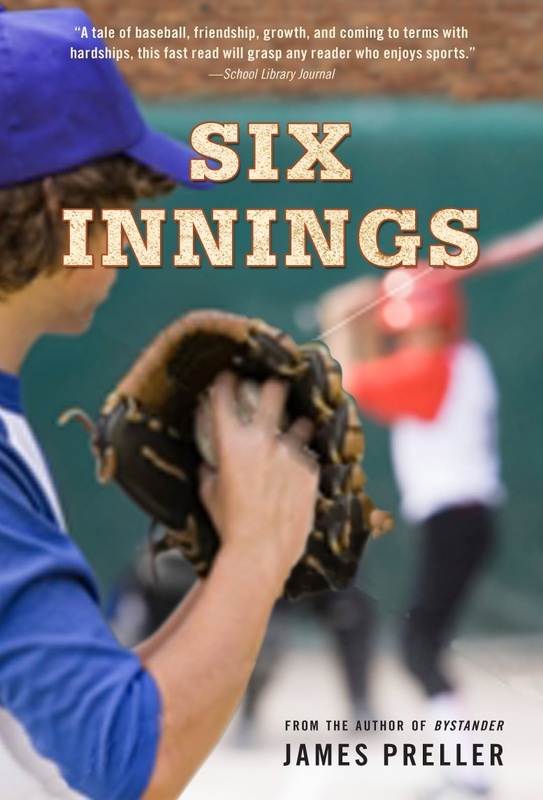 In Six Innings, it’s a minor scene (pp. 56-58), just a little backstory about one of the boys on the team. But for me, it resonates across the years, like an echo across a vast canyon. My dad and baseball. Our moments together on the diamond, a burnished memory, glowing like hot coals almost forty years hence. He was there. I didn’t appreciate it then, though I certainly recognized the uniqueness of the event; I was just a boy. But that’s what writing gives us, the opportunity to revisit, revalue, remember in the root meaning of the word — to re-member, to make whole again, to bring those disparate things together. Me and Dad and baseball. Postscript: Oh, yeah, about the name Lionni. That’s another tribute to a great children’s book author by the name of Leo. Someday I should put together a full roster. I see James Marshall manning the Hot Corner, nimble and loose; Maurice Sendak on the hill, strong-armed and determined; maybe sure-handed Bernard Waber over at second base . . .
Addendum II: Today is 1/16/2015, and I came across this post while hunting for other prey. It’s been a week consumed with writing — I’m trying to finish a book today that I started four years ago — and I’ve neglected the blog. Not that anybody cares. Anyway, here’s something. Also: a curiosity. My father was named Alan J. Preller, and grew up on Long Island. The new GM of the San Diego Padres, A.J. Preller, also grew up on Long Island. It’s not a common name. I’ve talked it over with my brother, Al, and we’ve decided he’s probably a second-cousin or something, connected to my late Grandfather, Fred Preller, 22-year assemblyman from Queens, NY. Ah, baseball. I never had a catch with my father, who never let me play organized sports, much less help coach a team. But we had an empty lot across the street from our house that we played in. And dad, despite working two jobs and having no free time, would haul the push mower across the street and mow that lot so that we had a better experience playing in our kid-made field. We don’t appreciate dads when we’re little. Great post! I love the nostalgia and the simple fact that just being there for our kids is the most important thing. My parents, with 7 kids, were there for as many of my softball games as they could be. It always meant the world to me to have their quiet support. JP ! I read a little bit about Fred Preller this week while reading Jimmy Breslin’s book about Branch Rickey! Love to you and your family — I’m still out here doing my best. Nancy, oh, that’s interesting. I’m not aware of that. Will have to check it out. Love back to you, too!